• A sustainable building that fulfills present and future library needs and uses. • A welcoming space that acts as an inclusive designation for all demographics of the community. • A flexible space that will be able to accommodate future reorganizations of the collection and reading areas. • A distinctive building that announces its unique role in the neighborhood as a place for public use. The Jasper Place Library’s role in the neighborhood landscape has changed over time. Originally the library prominently faced a large shopping mall parking lot. Over the years, a fire-hall was added to the north side of the site, and the mall has since undergone expansion, partial demolition, and partial replacement with medium-density condominiums. The current library itself has been renovated and expanded several times to the current size of 10,700 sq ft, and caters to a diverse demographic of approximately 38,500 people. In recent years, the number of users has grown, increasing demands on the facility. Reassessment determined that the library required expansion to 15,000 sq ft, as well as a redesign to suit the library’s latest objectives. A building audit was conducted to compare expanding the existing facility, which has continuing structural problems, with constructing a new facility to replace the existing one. Evaluation concluded that a new facility would best serve the needs of the library and community. The project consists of a new 15,000 sq ft library at the intersection of 90th Avenue and Meadowlark Road. Fronting onto 90th Ave, the library primarily consists of a large public space over two levels. The ground is occupied by most of the staff functions, as well as a double-height reading room consisting of book stacks and reading areas. This public area extends above the staff area to a mezzanine level overlooking the central space. Stairs (some of which are designed to double as reading spaces or an amphitheatre) are located at the ends of the mezzanine to form a continuous loop for patrons to circulate. An elevator is also provided as an option. A publicly-accessible outdoor terrace is featured on mezzanine level at the south side of the building. An undulating concrete roof structure with metal cladding covers the building footprint, and descends on the east and west. Glazing is predominantly used on the north and south facades, overlooking landscaping to the north and the entrance plaza to the south. Washrooms and the Community Room (used for library programs as well as by the community at large) are located adjacent to the entrance, so they may be used independently after library hours. Mechanical and electrical rooms are located on a basement level below the staff areas. On-site parking for library and fire-hall staff, as well as some public parking, has been provided along 156 Street on the east side of the site. The majority of public parking is located on the street along 90th Avenue. 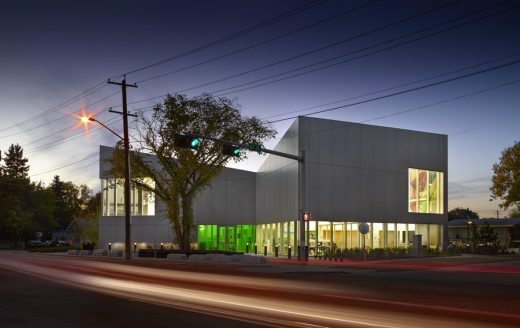 The design was in part inspired by the original 1961 Modernist design of the Jasper Place Library, and that period when the community was growing. The project will express civic pride, and celebrate structural honesty with distinctive roofscapes and strong profiles set against the prairie sky and surrounding trees. The proposed design attempts to utilize the library and community facilities to give the larger Meadowlark Community a distinctive landmark distinguishing it from other communities in the city. While the form of the building distinguishes it from the surroundings, it does so by working with the particular qualities and opportunities of the site. From the road, the design recognizes the site’s exposure to vehicles traffic and the potential West LRT along Meadowlark Road. For the pedestrian and patron, it offers the community a friendly welcome by using transparency to open its south and west faces to the passerby. 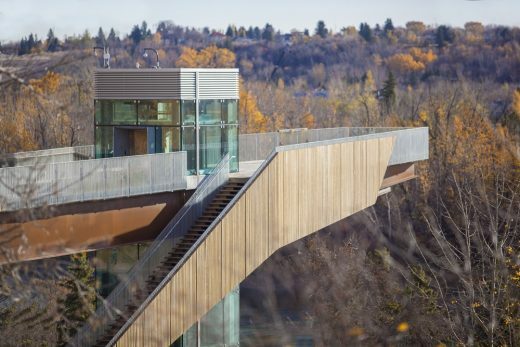 The design addresses the challenges and opportunities of building in Edmonton’s climate. The large southern exposure of glazing will invite considerable sunlight and thermal comfort during the winter, while being shaded from the summer sun by a combination of an overhang, sunshades, glass coatings, and trees. Additional natural light will be provided by the glazing on the north facade, while the more opaque east/west facades will limit the heat gain that comes from the horizontal morning/evening sun. The roofscape is designed to shed water and melting snow through a series of peaks and troughs. The concrete structure will be insulated and clad with a metal roofing system. 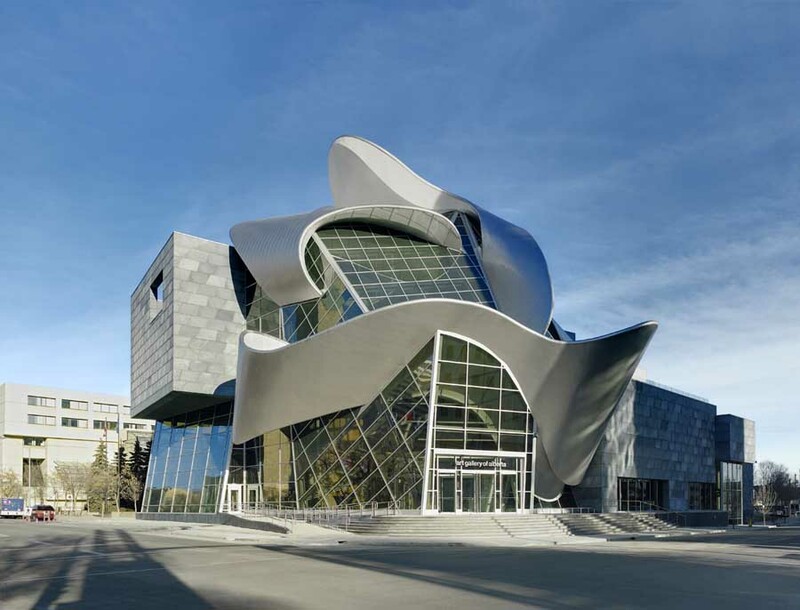 Although the materials were chosen in part for their durability and ability to express a sense of civic permanence, they will be used in a sinuous form that also evokes an inviting and playful softness. The concrete structure will be exposed to the interior space, which continues over the entry plaza. Sustainability on all fronts is a central focus. The design seeks to create a memorable space of lasting social value. The functional longevity will be strengthened by an open, flexible floor plan that can accommodate future reorganization and adaptation. Environmentally, the facility will use the LEED® standard (aiming for a minimum of LEED® Silver certification) to ensure sustainable strategies. The project will incorporate a public art component through the Edmonton Public Art program. 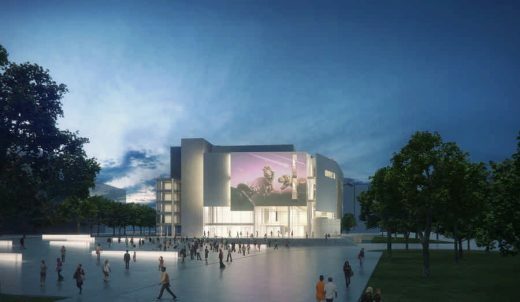 While a specific artist/work has yet to be determined, the expectation is that the artwork will be thoughtfully and meaningfully integrated into the architecture and site.